One of the most important moments for a sales representative is the meeting with the client. To be as effective as possible he must be well prepared; every detail is crucial and decisive. To close deals fastly and effectively, sales rep has to be prepared perfectly with the right and up-to-date information. For that, he must access to his e-mails, business cards and files at any time and any place, since the information is generally not centralized. In case of a lack of customer history, the sales agent will more likely have no information concerning his customers and their previous orders. This can be the consequence of the manual hand-written information and orders, that were probably thrown away. Actually, following the old fashioned sales method, sales rep has to use all his heavy catalogs and leaflets, which means that the client will not have a customized and attractive presentation, without product updates such as product quantity, price reductions, special offers. Therefore, the sales rep will not be able to adapt his presentation to each customer need. However, a sales rep day is too long to finish. Once the deals are closed, all the orders an requests have to be collected, filtered, dispatched then reported, with taking into consideration all the details collected. Any tiny details makes a difference when processing the order. Then, at the end of that long day, and after all this wasted time and effort, it is widely expected that one of the orders made is not in stock anymore. The sales manager will certainly appreciate! We Have the Suitable Solution for You ! What if we offer you the solution that will vanish all these problems? 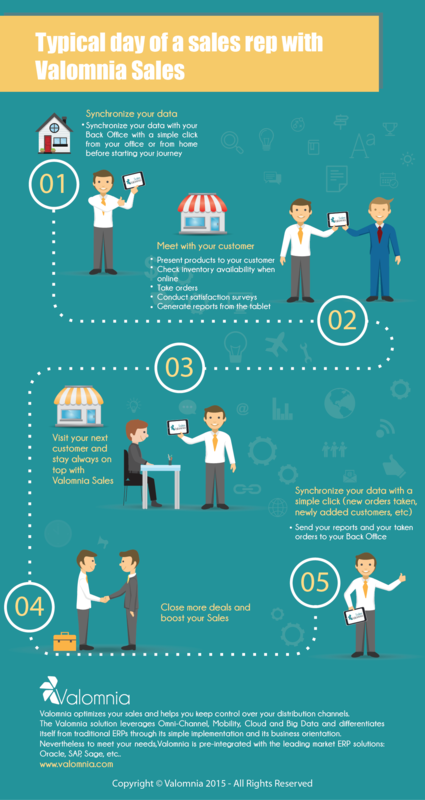 Valomnia Sales is not just an application, it is a solution for sales representatives to facilitate their every day work. Using Valomnia Sales -the Sales app available on iOS & Android- is the best way to approach a client and succeed before, during and after meetings. Within minutes, the sales person connects to the cloud and creates his own store with his company information (logo, name, address ‚..), his products with pictures and descriptions, added to his inventory are classified into different categories. Then, the sales rep enters all the customer information manually or imports it directly from a prepared list. Once it’s done, the information can be shared with all the sales team through the multi-user function. Being well prepared for a meeting with a customer will help the sales rep deliver an effective speech, which can leave a positive lasting impression. In fact, the geolocation feature will allow the sales rep locate his customers and therefore be able to prepare his visits more efficiently. The sales rep could also have full details about all products thanks to the automatic reports feature that allows the sales rep to find written reports’ history for each product. This allows providing a detailed overview of every product with the time spent watching the product, the ranking that the customer gives but also comments drafted by the sales rep. This feature helps to better understand the desires of customers and thus enable the sales rep equipped with Valomnia Sales to have a competitive advantage on a sales rep who uses conventional tools. Each customer adapt his choices to his targeted clients. Thus, strategies and products’ choices varies. As a sales rep, you have to follow that with a flexible and adapted presentation in order to attract him. Once at the meeting, the sales rep puts the spotlight on the customer’s desired products so that he adds them immediately to his cart using the quick order feature. Simultaneously, he can check the product availability in real-time. This will avoid placing orders of out of stock products. If the deal is closed, the customer can directly sign on the tablet and print the PDF order document, and forward it to the back office right away. Even in off-line mode, the data will be stored which enables the sales rep to synchronize the data by connecting to the cloud space when the Internet connection is restored. After the meeting, a report containing all the information collected during the visit will automatically be generated. The sales rep has a space to add his notes and comments, too. Therefore, the sales rep can have better view on each customers’ needs and requirements for the next appointment. Valomnia Sales offers you the tools to success.